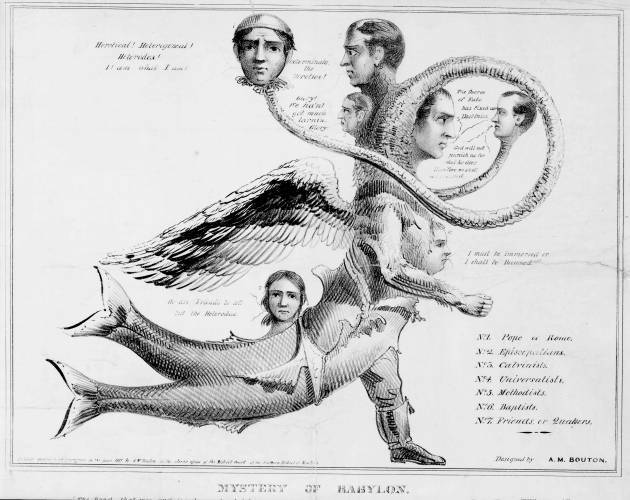 An anti-religious satire attacking most of the major denominations of the nineteenth century, including Catholics, Episcopalians, Calvinists, Universalists, Methodists, Baptists, and Quakers. The artist parodies their respective religious beliefs and/or forms of intolerance. A chimera-like beast is shown, with seven heads, each representing one denomination. It also has wings, a forked fishtail, and the leg of a human. The various heads speak. Pope of Rome: "Heretical! Heterogeneal! Heterodox! I! am what I am!" Calvinists: "The Degree of Fate has fixed our Destinies." Universalists: "God will not punish us for what he does therefore we shall all be saved." Methodists: "Glory! We ha'nt got much larnin. Glory." Baptists: "I must be immersed or I shall be Damned." Friends or Quakers: We are Friends to all but the Heterodox." Below the title are lines from the Book of Revelation, "The Beast that was, and is not, and yet is." The Library's impression was deposited for copyright on April 10, 1835. Weitenkampf misreads the artist's name as "Benton."